Why Is Software Risk Management Essential to Companies Today? As companies continue to rely more and more on software for completing business-critical operations, the practice of software risk management increases in importance. A system failure can result in devastating consequences that not only bring a business process to a halt, but may also harm the reputation of a company. Why Do Businesses Need to Assess Software Risks? Software risk management is a process designed to aid in maintaining fine control of potential threats for continuous, dependable operations and limited costs. With so many businesses operating on a global level, it is imperative to be aware of and prepared for potential software risks. A proactive approach ensures continuous operations, the utmost security, and protects your brand. CAST supports software risk management by exposing the weaknesses in complex multi-tier systems, identifying the high severity engineering flaws undetectable by traditional functional testing tools and processes. For a personal evaluation of how CAST can increase quality and reduce risk in your technical organization contact us at: 877 852-2278 or request a call here. Procedures must be developed and used to mitigate or control each defined threat. This process is detailed, hard to manage, and can result in numerous complications if threats remain unidentified or are not controlled correctly. Software risk can be divided into technical risk and business risk. Software risk is often used to determine software testing effort. Technical risk relates to the complexity of software technical implementations, the more complex the implementations, the higher the risk of implementing it correctly without errors. 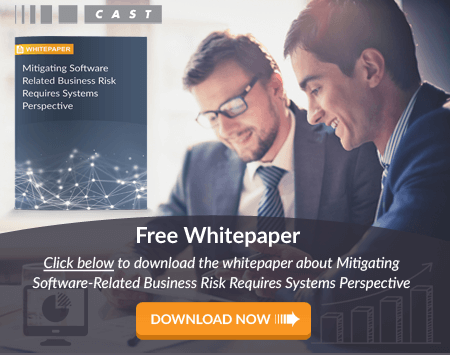 Business risk relates to effectiveness of software in meeting business risks, the higher the need for software functionality to work without fail, the higher the impact of failure. The combination of implementation complexity and functional integrity will determine software risk factor. 4 Software must execute correctly or grave consequences (loss of life, loss of system, environmental damage, economic or social loss) will occur. No mitigation is possible. 3 Software must execute correctly or the intended use (mission) of system/software will not realized causing serious consequences (permanent injury, major system degradation, environmental damage, economic or social impact). Partial to complete mitigation is possible. 2 Software must execute correctly or an intended function will not be realized causing minor consequences. Complete mitigation is possible. 1 Software must execute correctly or intended function will not be realized causing negligible consequences. Mitigation is not required. It is obvious that the higher the risk factor, the higher the software integrity level, the higher the effort is needed in terms of the breadth and depth of software testing. With this guideline, software testing effort will be spend more effectively and better software is produced to meet business needs, resulting in happier business users. CAST supports software risk management by exposing the weaknesses in complex multi-tier systems, identifying the high severity engineering flaws undetectable by functional testing.